This innovative new Reverse Umbrella makes exiting your car much easier in the heavy rain. Also features the new style C handle, which is comfortable and convenient to hang over your wrist, freeing up your hand. 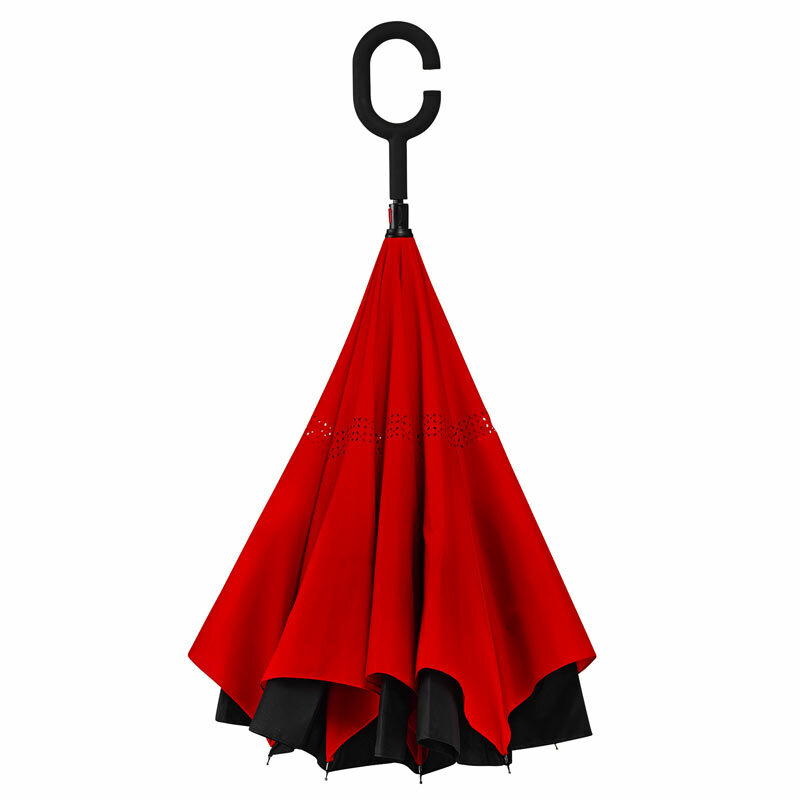 Introducing this fantastic red reverse umbrella. 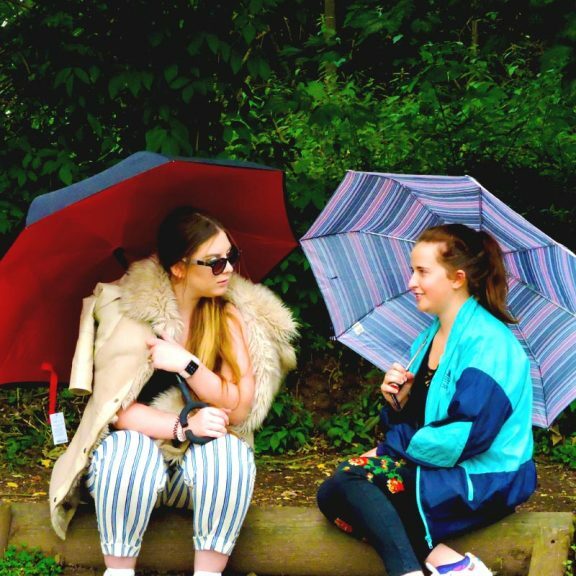 New to Umbrella Heaven, this stylish, sleek and unique umbrella is certain to liven up anyone’s day, be it rain or sun! 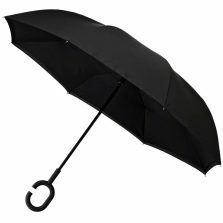 We have literally leapt into the 21st century with this innovative new umbrella which challenges the very idea of the traditional brolly. The reverse umbrella is something of a new phenomenon in the umbrella industry, the first of its kind; this reverse umbrella can stand on its own when closed without the need for support. 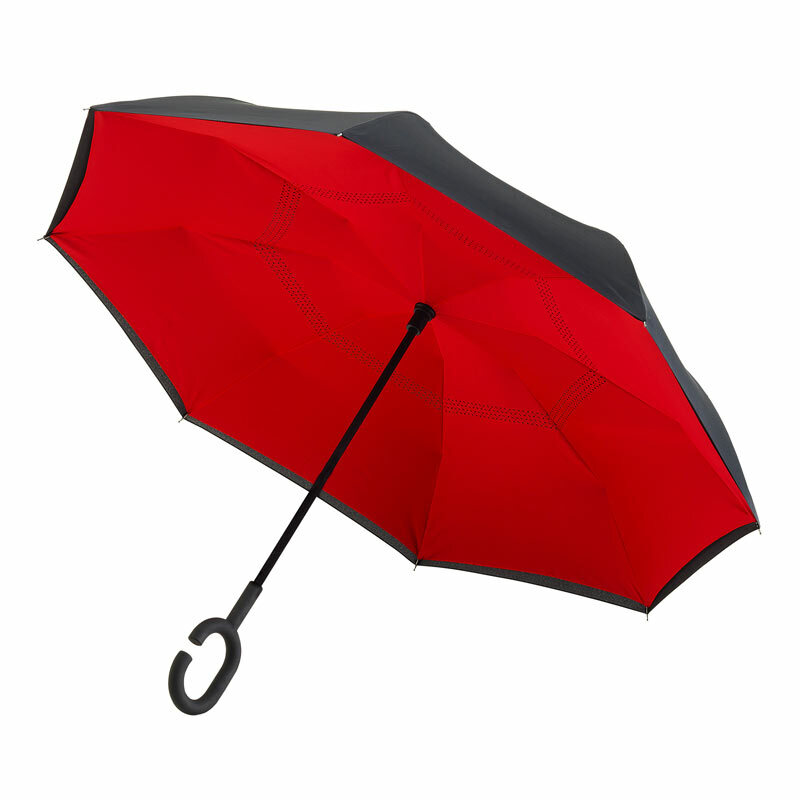 Not only this, but it’s striking red and bold black double canopy makes this brolly both high quality, protective and waterproof. It’s striking red interior alone is enough to bring colour to a grey day. When open it has a canopy span of approx. 98 cm and is 79 cm long. 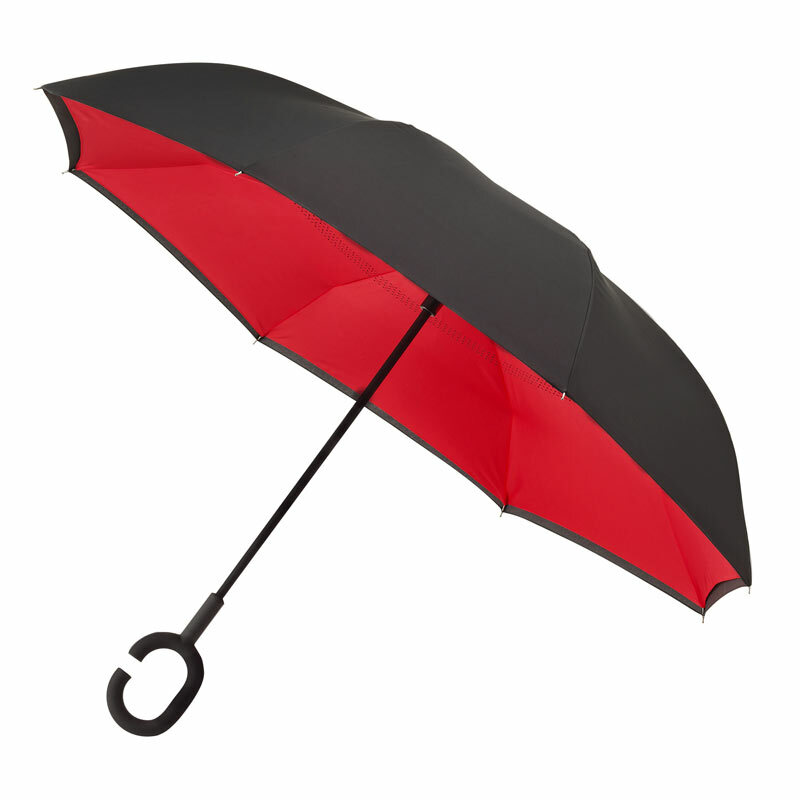 It even has a little red push button to lock the umbrella open and closed. 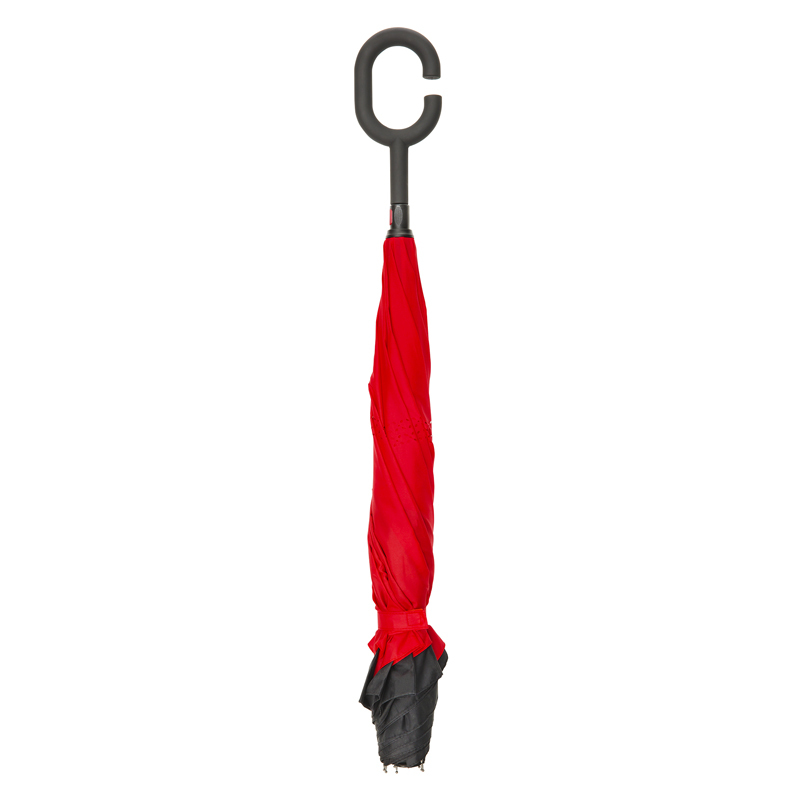 Not only all this, but it’s unique ‘C shaped’ handle makes storing, holding and hanging this reverse umbrella a breeze. It’s quite comfortable to hold and you can hang it over your wrist to free up your hand. Very useful when you’re trying to open a door, hold a bag, your mobile phone or a cup of tea! This windproof, free standing and utterly unique umbrella also features a flexible fibreglass frame, perfect for your war against the wind! 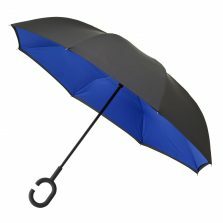 This really is a special umbrella, so if you like standing out, looking good and of course staying dry, this is the brolly for you. 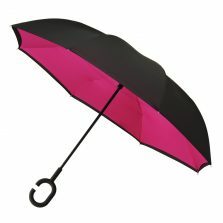 And if red isn’t your colour, this fun and functional parasol is also available in black, pink and blue! Being double canopied this umbrella also makes a neat parasol. Use it on a sunny day to keep the harmful UV rays at bay. This umbrella is totally ‘Marmite’. You will either love it or hate it. Being die hard Umbrollogists it’s taken us a while but we are now in agreement. We love it! Not the umbrella for you? 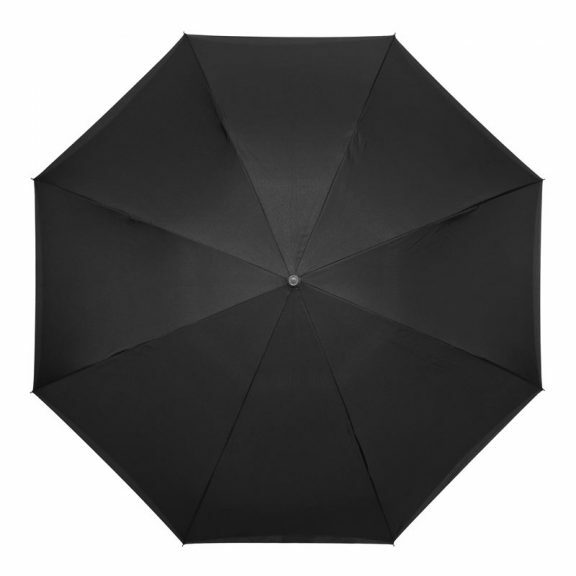 Check out the rest of our range of quality specialty umbrellas!